DriveItAway and CloudOne formed what the companies called a “ground-breaking industry partnership” this week that is designed to help dealerships cater to customers who have subprime credit and are looking to lift their incomes by potentially joining the ride-sharing industry. 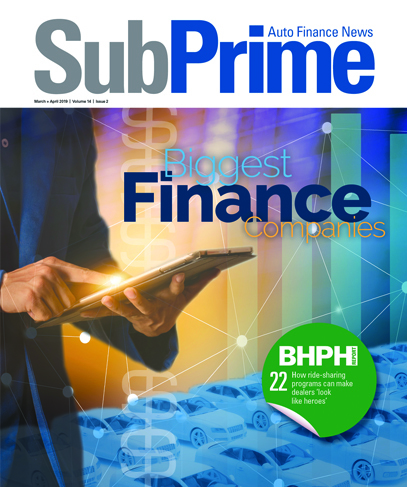 The companies are collaborating on a product so dealers have ability to design, develop and deploy both traditional and digital advertising campaigns geared toward potential vehicle buyers in the subprime space. These potential buyers now can use “on-demand” employment through ride sharing as a means to a “path to ownership” through a rent to own process enabled by the DriveItAway app, regardless of the availability of immediate down payment cash or past credit history. DriveItAway and CloudOne estimated their relationship could put 40,000 subprime customers a month into vehicles. CloudOne owns and operates one of the most fully integrated automotive call center-based infrastructures within the United States. CloudOne is specifically designed to facilitate new- and used-vehicle sales, while also providing conquest digital marketing services and credit-based lead generation through its wholly-owned subsidiary, CreditYes. “We look to simplify and enhance this subprime lead appointment volume, and improve sales through our process, enabling people who would ordinarily lack the means to purchase a vehicle immediately a path to ownership by using the on-demand income that ride sharing provides with a rent to own program through our DriveItAway platform and app,” DriveItAway chief executive officer and founder John Possumato said. CloudOne founder and chief executive officer Jim Crouse is a long-time expert veteran in the subprime lead generation business, having founded and sold Bar None, a subprime lead generation business that helped more than 5 million subprime customers acquire vehicles. “I think this is the ultimate win-win-win scenario,” Crouse said. “Ride share has dramatically increased the total miles cars travel by nearly 250 percent, mostly pulled from public transportation. For every 100 miles driven with a passenger, cars drive an additional 68 miles without a passenger. More miles mean more cars, more drivers, more service needs. “The CloudOne, DriveItAway partnership provides a turnkey solution for dealers to channel this overwhelming demand right through their front door, into their sales department and service centers,” Crouse continued. “Previously unsaleable customers now have a path to ownership, dealers sell more cars, service more cars, while ride-share companies get more cars on the road — win-win-win,” he went on to say. This week’s development continues a string assembled by DriveItAway that includes a partnership with MyDealerOnline to give ride-share drivers “unprecedented choice” in selecting a temporary vehicle to drive as well as an arrangement with Get Credit Healthy to pilot what the operations say is the first “no strings” free national credit repair/rehabilitation service for Lyft and Uber drivers. Dealers can get more information by reaching out directly to DriveItAway at info@driveitaway.com.